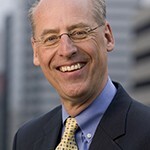 Wim Wiewel is President, Lewis and Clark College. With such publications to his credit as Global Universities and Urban Development (2008), The University as Urban Developer (2005), and Partnerships for Smart Growth (2005), Dr. Wiewel has a deep theoretical and practical knowledge of the relationship between universities and the communities they serve. Under his tenure, PSU became the largest and most diverse university in the state. Retention and graduation rates increased every year, while funded research went up 50%, and fundraising more than doubled. President Wiewel’s leadership has not gone unnoticed, and since his arrival at PSU he has received the inaugural Presidential Award from the U.S. Green Building Council’s Center for Green Schools as well as the Leadership Award from the Council for the Advancement and Support of Higher Education. He has served as chair of the Coalition of Urban Serving Universities and is the past chair of the Climate Leadership Steering Committee, as well as a board member of many other local and national organizations. Wim Wiewel holds degrees in sociology and urban planning from the University of Amsterdam and a PhD in sociology from Northwestern University. Prior to joining Portland State, he was provost and senior vice president of Academic Affairs at the University of Baltimore, where he led efforts to broaden the university’s role in the city’s revitalization. Dr. Wiewel also served as dean of the College of Business Administration and the College of Urban Planning and Public Affairs of the University of Illinois at Chicago, where he helped establish the Great Cities Program and the Center for Urban Economic Development. Besides the aforementioned books – and other books – he has authored dozens of articles in such publications as Economic Geography and the Journal of the American Planning Association. Wim Wiewel is married to the architect Alice Wiewel and together they have four children.